Movie Web recently spoke with Mark Duplass and he told the media outlet a tiny bit about his upcoming project. First and foremost the film is titled, "Jeff Who Lives at Home." Jason Reitman will produce and the film is planning to begin shooting in April or May for a early 2011 release. Mark Duplass said that the film follows a stoner on a quest. He said, "Our next movie is called 'Jeff Who Lives at Home.' It's our take on a quest movie. It's like a Sword in the Stone movie. But it's starring a stoner who is looking for wood glue." A stoner searching for wood glue? I'm sure for those of you who have never seen a Duplass film, you are thinking what the hell? 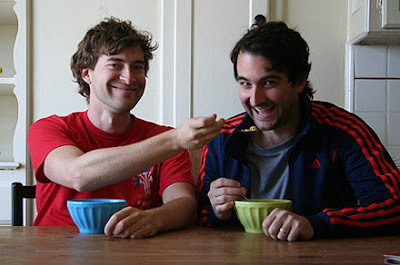 But I assure you, the Duplass brothers can do wonders with this simple topic. And I for one am ecstatic to see it play out. Mark Duplass also teased about the idea of taking on a movie like this. He said, "We are always going to mess with genre and use it to our favor." He later added, "This is the movie we were born to make. We are more than ready to jump into this one." I totally believe Mark Duplass in his statement and can't wait to see how this film pans out.